Classic Purple Hooded Sweatshirt with Gold and White Elmira College Almuni Print. 50% Cotton/ 50% Polyester. Russell. Purple keychain with Alumni and Elmira College Seal laser engraved. LXG. Purple mug with Elmira College and the Elmira College Seal printed in gold and Alumni printed in white. Classic Grey Hooded Sweatshirt with Purple and White Elmira College Alumni Print. 52% Polyester/ 48% Cotton. Russell. Bssic Crew-neck Sweatshirt with Elmira College Print. Comes in Purple and Grey. Purple: 50% Polyester/ 50% Cotton. Grey: 52% Polyester/ 48% Cotton. Russell. Classic T-shirt with Elmira College Alumni Print. Comes in Purple with Gold/White Lettering and Grey with Purple/White Lettering. Purple: 100% Cotton. Grey: 53%Polyester/47% Cotton. Russell. 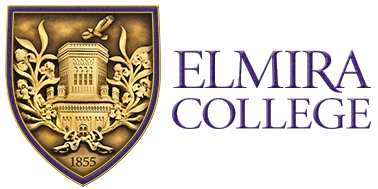 Purple and gold Elmira College inside Alumni car decal. Spirit Products.